Alison is a floral designer & educator that teaches florists how to embrace the business side of the business so they can make more money and take control of their future. She's been working in the floral industry for 25 years; after spending 8 years training in half a dozen flowers shops, she opened a home-based floral business in 2002, which focuses almost exclusively on weddings. After this show be sure to visit realflowerbusiness.com which contains Alison's business tips & teachings. Don't forget to mark your calendars for April 16th for our next show - Dave & Shelley will be back helping to answer your flower questions. - Good morning everyone, Yvonne here. 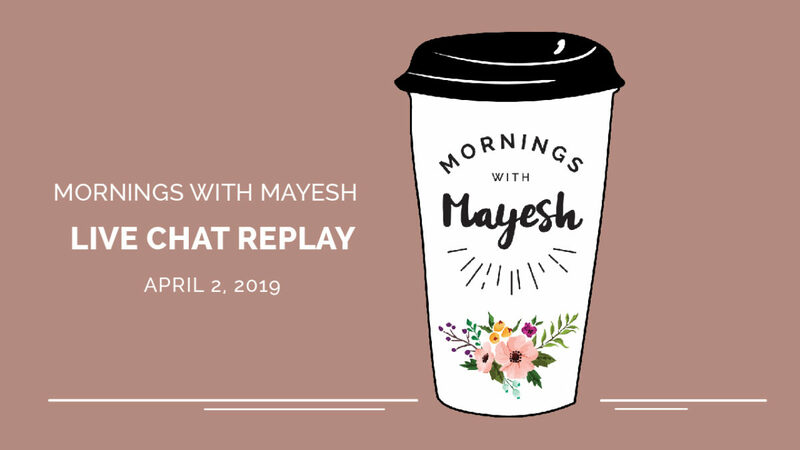 And I am so excited to bring you another Mornings With Mayesh, April 2nd 2019, can you believe it guys? Happy April. And I'm super excited because I have a very special guest with me, Alison Ellis, she's gonna be coming on in a few minutes to talk about pricing questions. If you don't know Alison she is from Real Flower Business and she has a lot of Real Flower Business knowledge that she wants to share with you guys, so super stoked. I'm gonna give everyone a few minutes to come on in, say good morning, good morning from Just Floral, thank you for joining me. And Penny, you guys are amazing, thank you literally for being here every time I go live, I love you guys. I feel like if you don't show up I don't know what I'm gonna do. And while everyone is coming in and saying morning and letting me know where you guys are from, and also please share, yes, that would be amazing, thank you Penny. Good morning Hailey. I'm just gonna go through a few housekeeping things, alright guys. So just keep on saying hello, if you have comments or questions make sure you post those in the comments section, I'll be going through those as I'm talking with Alison and going over your questions, I'm sure we will have some time for that, so very exciting, that's like my favorite part giving all the live back-and-forth. Also if you aren't able to stay for the whole show, or you just can't make it at all and your listening later, thank you, but we will be hosting the replay on YouTube. The replay will be available immediately on Facebook, it takes a couple of minutes for it all to process. And then we also turned the show into a podcast, so if you are into podcasts and you like to listen and exercise or design flowers, you can listen to us while you're designing flowers, that is available for you as well, and that will be up on our blog. So that will happen in a couple of days. So keep a lookout for that. Also I wanted to make sure that you guys know about our Mayesh Design Starflower Workshop Tour. So we have three more dates left, May, August and November. And we are gonna be hitting up Nashville, Austin and Columbus. So very cool, we have Sean Strong, we have gotten really great reviews. So I do do surveys and things like that at the workshop, because while we are there in person, it's always I think scary for people to give us real feedback face-to-face. So I always send that survey so that way people can send out their honest opinions, and we definitely are getting high marks across the board. So I promise if you are on the fence, you're not sure what you want to do, take the jump, take the leap, invest in yourself, do something outside of your bubble, get to know some people. Travel, because I know a lot of people travel. Build up your portfolio because you get amazing professional pictures from our amazing photographer Nicole Cleary, and then obviously get to work with Sean Strong who's amazing. So we will post the link for that, you can go and take a peek at that, let's see where do I do this at, because I'm doing this all on my own today. There we go, I did it, yay. Also I wanted to let you know about Quito, so if you are on the live and you know that I was out of the country a couple of weeks ago, and it was literally the most amazing experience I've had in my life, and a really long time, besides having my babies and all of that. Work life right. And so I just wanted to make sure that you guys know about this, it's gonna be published in Florist Review. Am I allowed to say that early, I don't know, I just did. So super excited about that, and we're just gonna be putting all the videos and photos out, it's not out yet, all of our professional things that Nicole did and Logan from Tailwind Visuals, he's amazing too, an amazing storyteller. And just excited to share this story with you guys. And also I just want to make sure that you guys know about it, because people were crying because they were so happy, and so we know a lot of our students who came to Quito with us are gonna be going to the next one. We are working out those details as we speak. I will hopefully be publishing something soon, but if you want to be one of the first people to know about our next international workshop, be sure that you go and visit our website, if you go to the MDS workshop dash Quito link, and I'm gonna post that for you as well, there will be a form so that where you can fill it out and be put on our wait list type of deal, and then I will send out an email to you guys, after I send out an email to all of the people that went to Quito first. So they are number ones, and then our form will be number two, and then I will let the world know about it after that. So cool. And Desi is here, good morning Desi. She's gonna be helping me post links and things like that going forward, thank you Desi. Everyone say good morning to her, hello. She's behind the scenes helping me stay sane while we're doing this live show, so I don't hit any wrong buttons. Also make sure you save the date for April 16th, that will be our next regular format show, I will be back with David Shelley answering your flower questions. Alright guys. Let's see who else is here? Good morning Katie Lee, good morning Jennifer, hi guys. Shelley from Maine, hi Shelley. Shelley is one of the amazing people that went to Quito with us, and thank you for joining us Shelley. I have Tracey from Greater Omaha Chapter of the National Association of Catering and Events, hi Tracey, that's a mouthful right. Good morning Hailey, and Amy from Grosse Pointe. Awesome, I love having you guys. So if you're just joining me, welcome guys, I'm Yvonne Ashton, here with Mornings with Mayesh. Today I have a very special guest, Alison Ellis of Real Flower Business whose gonna be answering all your questions about flower pricing, super super exciting. If you don't know anything about Alison, she is a floral designer and an educator, she is huge in education. That's one of her passions, if you watch anything on her Facebook group you can just see it oozes out of her pause. And she loves to teach florists how to embrace the business side of our business so that they can take more money and take control of their future, which I love, and obviously we need strong florists for a strong industry. She's been working in the flower industry for 24 years, it might be 25 now I think. 25 years. After spending eight years training at half a dozen flower shops, she's opened her own home-based floral business in 2002 which focuses mostly on weddings. So after this show make sure you visit RealFlowerBusiness.com and that'll contain all of Allison's business tips and techniques, so let me bring her on. Good morning Alison. - Hi good morning, can you see the top of my head? - Thanks so much for having me this morning, I'm so psyched. - Yeah I just realized I used my intro from the last time, I always recycle things. - And 25 years is a big deal though, congratulations. - It is, I started when I was two, and I've been doing it ever since. - Awesome. There are a lot of people that start when they're two, my husband used to ride his big wheels through flower wholesalers. - Yeah, I started when I was 16 actually, and never left, it was really something that I fell in love with right away, and I feel like there's two types of florists out there, there's the florist who just loves flowers so much, and then there are the florists who are business oriented and they could do any business, it doesn't really matter to them what type of business. I'm definitely a florist at heart, kind of floral designer, that's who I am. - I love it, I love it. So let's kick things off with just an easy question, and just tell us what you've been up to in the past year, because that's the last time you were on the show. - I know, I like it, we should have an April, it's like our anniversary show. What have I been up to in the past year, that's a big question. Time flies by so fast, but I took a couple of notes, what I've been up to is weddings, teaching, I was honored to teach at a chapel designer workshop last May and I was invited to teach down in Rhode Island in December, so while I do all my teaching online, it was so exciting to get to have that interaction in person. So that's what I have my sights on, I'd love to do some more of that. But I've been doing some one on one coaching and strategy sessions with florists who were interested in taking a course, but didn't know what course. So I was doing these free strategy sessions where we were talking for 1/2 hour about their business and getting them into the right course, and that was working at so well, because then it's not just me being like here is my website where I sell stuff for florists. It was like, what do you need, and how can I help you. It helps focus you in. You know this as someone who has specialized in marketing. It's about the customer, and so the more we talk to the customer, the clearer we are. So I really feel like I spent the last year talking to my customers and figuring out what they really needed from me, and then making more freebies and more resources for them, lots of content creation. - Blogging, blogging, blogging, you know? - Yeah, and that's my jam, I love all the content that you created, so powerful for everyone. - So appreciate that, because you put it out there, and as you know you don't always hear how many people are seeing it and liking it, they look at it but they don't acknowledge it. So it's always so appreciated when someone does acknowledge. I'm gonna call out Dee, she's on this live chat, I can see her over here on my Facebook. Dee thank you so much for sending me a message the other day, she was like, your font is too small on your emails. Boom, I was like, you know what, you're right. There are little things like that are huge. I've been increasing the font on my emails for the past week. - That's awesome. I feel like with our content I can tell when we do downloads, like the gated content and what's popular and things like that, just based off that. But our regular content, it is sometimes difficult, it's not always a science like everyone makes it seem like, it really isn't. But I do find that anything that's controversial, we always hear from people. So it's fun to do things like that on purpose, if you know people are gonna get riled up about it. Yeah, we're gonna hear from people. - Yeah, get them out of their seats. Because you can create something, like I'll create something, like this is so good, people are gonna love this, and then it's kinda crookedly, and then you create something just on a whim, and I created something I posted a few weeks ago, or January, it's been shared 400 times, like what's happening here, that never happens. So you just never can tell. That's why we just do what we can, do our work. - Exactly, exactly. I love it. Alright, so we're gonna start off with our first question from the wildflower easy, these are questions that we sourced from our Instagram question post story which is always fun. And they want to know should we set a minimum on weddings, I've done both ways. - That's always a really really valid question from any floral designer. And the real honest answer is it depends. So it depends on a lot of things, where you are in your business for example. If you're busy enough where you can turn customers away, setting a minimum is a good strategy. Because if you're getting too many inquiries coming in and you're finding you have a lot of lower budget clients that are trying to get in the door, setting a minimum helps to weed out people that are not a good fit and set that bar. You must be this tall to ride the ride, and that's just what it comes down to. This is my standard of the work that I do. And that can work really well for people. And then you have to decide do I publish my minimum on my website. So there are a lot of things that go into not just setting the minimum, but then how do we communicate that minimum to the potential customer. So I like to do everything, like I was just saying, customized. I think it's really important to look at the individual. So I've been in business for 17 years on my own, I'm entering my 18th season. So what did I do last year? I finished season 17 of my business, which is like snaps right? And what I find interesting, because I have my Facebook group, there's about 7000 florists in there right now from all around the world, and I asked just two questions just before you get in. What's your ability level, are you aspiring or have you been doing this, and sometimes people have been florists for 40 years, or they've been florists, maybe they've been florists for five years, and it's so fascinating to me to see how people will identify themselves. I've been in business for 40 years and I'd say I'm aspiring. Versus someone who is like, I've been in business for three years, I'd say I'm experienced. - And that is often how it goes. The longer you have been in business, the more humble you can be about how much more you have to learn. And the newer you are, when you're in business for three years or five years, you're like look, I've been in business for five years, and let me tell you everything that you need to do. You haven't been tested in five years yet, you know what I mean? Five years is great, and it's a hump in your business where if you make to your five in your business, you should be celebrating and tooting your own horn, that you have been in business for five years. three to five years is that threshold. But when you're in business for five years your minimum is gonna be different, or your thought process on the minimum is gonna be different than someone who's been in business for 40 years. And again, it's gonna depend. The person who's been in business for 40 years, may have a really strict minimum, or they may have no minimum at all. So it's based on your experience and what your market can bear. So if you're in an area for example where you do tons of high end weddings, having a $5000 minimum might be just perfect for you. Publishing on your website might make perfect sense. But for me personally where I am, I'm in Vermont, we do destination weddings mostly, meaning people come here. I don't travel, people are like, how do you do that? I am like, they come to me. So they come here, and their budget could be a huge gap. I've had some weddings that are $2500 really small, like really small weddings, nothing fancy. Then I have an $8000 in June that's like all the bells and whistles and more, more, more. So if I put on my website I have a $3000 minimum, I'm missing out on that $2500 super sweet gig that I booked, and for my $8000 customer, they might be thinking hmm, is this $3000 florist gonna get what I'm looking for here. So when I used to publish my minimum on my website, which I did for years, finally you have to get brave, there's a moment where your brave, and you're like, I'm doing it, I'm doing it, I'm setting a minimum. That's it, I'm doing it. And it takes bravery, and you have to talk yourself into it right? You have to talk yourself into I'm gonna set the minimum, I'm really gonna do it, I'm really gonna tell them, I'm gonna do it now, here I go, I'm hitting publish, and now my website says I have a $1500 minimum. That was my first minimum. Then it went up to 3500 or something. So finally it got to a point where my $3500 minimum was significantly below the average spent that people when they made a purchase with me. So here I have on my website $3500 minimum but my average sale is higher than that. Why is my minimum 3500? So it was a moment of reckoning, of realizing this is arbitrary, this number does not pertain to you, the person inquiring to me, this is just a number I'm throwing out there, just throwing to the wall and see if it sticks. So there is a change, there is an ebb and flow in business, so sometimes you should have an idea. I always put it this way, if you don't have a set minimum, we don't leave the door for less than 3500 at least have minimums on each of your itemized pieces, so your bridal bouquet start at X, your centerpieces start at X, your installations start at X, so at least when you're putting together the pieces and presenting a budget to somebody There is a rhyme or reason for why they should be expected to spend this minimum. And the way I do it as I present it as a custom minimum, I say for your event this is the minimum that would be requested. And one of the smartest things I do if I do say so myself, is I missed that minimum on every single client proposal right in the payment terms, so before they accept the proposal, before we do anything They see right there this is what the minimum is for your event, so they know that they can't fall below that. They can lose three bridesmaids, but you still have a $4000 minimum. You can have half as many guests, but you still have to have a 4000 minimum for me to block off my day or my weekend for you. So we have to set our rules and then we have to change the rules, and that's my really really long answer too, should you set a minimum. - That is great and I actually love the idea of a custom minimum. And honestly for me personally I get really frustrated when I'm on websites and I'm just trying to figure out what I like and what I don't like, but then I have no idea how much anything costs. I get frustrated especially when it's my first time dealing with something and I'm trying to get information and everyone has it all blocked and you've got to call, and I don't like talking to people so I don't want to call you, I just want to figure things out on my own first. So I think that's a really great way to get started and have a happy medium, and not scare too many people off, but still give them enough information, I think that's really cool. - So you still set the boundary, there is still a minimum and it's not like I'm just saying to them, so for example, I might send out a quote to somebody for $8000 but only request a $4000 minimum, because I don't really need them to spend $8000, I just need them to be in it with me for this much. And if they want to spend more than that, great. But then there are other times where I met sent out a quote for $3000 and the minimum is 3000, like I'm not falling below this. So it just makes it really clear, makes the communication clear, and it's that custom interaction, they feel my value because they see that they get an email from me, usually we have a conversation, not always though right, because that inquiry form that they sent to me I do my vetting through that. So I can tell do I need to present my minimum to this person before we go any further, or are there enough clues in everything that they have answered here that I can tell they're gonna spend what I need to make this worthwhile and just hop round to the phone consultation. But we are not meeting in person, they are not taking a ton of my time before an absolute minimum purchase is established. Always. - Good stuff. Alright, next question is from Karen MRK7, she wants to know do you price anything differently with a hand tied versus a vase arrangement, I'm thinking she's probably trying to get a do you price it differently based off of the labor intensiveness of whatever you are designing.